We have endless water at the farm. Most of the time. It’s a true luxury. It runs day and night, and we do our best to route it to the most useful places so that its abundance isn’t wasted. It’s easy to be casual about it, because if it isn’t used it just means that a cistern somewhere is overflowing. We have hoards of water. Until once a year–in September and October–when we don’t. We are usually one of the last farms to dry up. Many of our friends reported dry wells long before our stream slowed to a trickle. The top of the farm usually still has a few springs that keep going. But our house? Dry as a bone as of a few weeks ago. I’ve learned something new about myself. I can cross continents, do international travel with a toddler, learn a new language, navigate foreign bureaucracies and strange cities, learn a new culture and a variety of other adventures without batting an eye. But, by gods, there had better be running water at the end of it all. Our water ran out, and we gamely soldiered on for a few days. We conserved. We used water that we brought by the gallon from town (which also is starting to have shortages and rations in the afternoon). 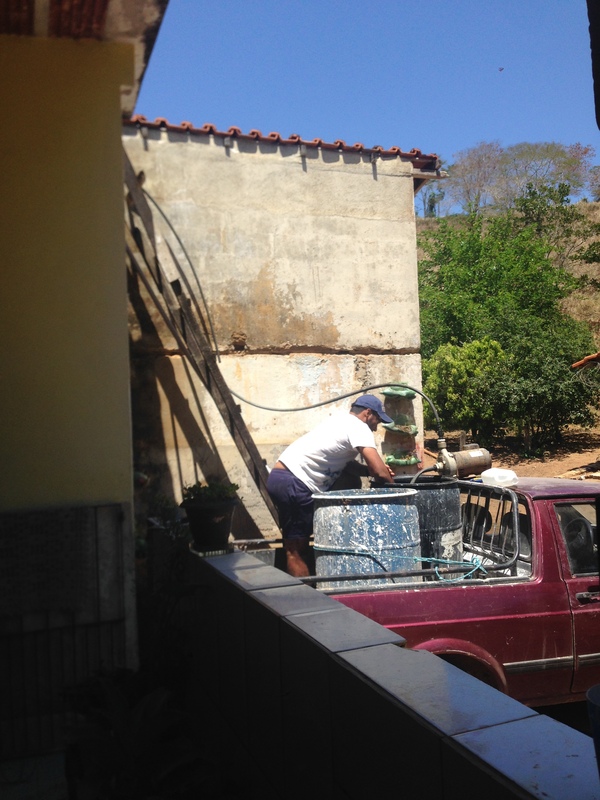 We talked to the municipality about bringing their water truck to refill our cistern and they turned us down–their water is low enough, they said, that they needed to save it for city and couldn’t justify trips to the rural zones as they had in the past. And somewhere in there I might have had a small breakdown. I grew up in a rural zone with a shallow dug well that sometimes ran dry. I know how to conserve–military showers, reusing your greywater, flushing only when necessary, the whole lot. But juggle a house, a toddler, and a full-time job all with no running water at all? There might have been tears shed and strong words spoken about finding another wife because this one wasn’t up the challenge. I’m not naive. There are many women in Brazil who do this. The entire Northeast region lacks water for months on end. People walk miles for a few buckets. The entire city of Sao Paolo was on water rationing, with running water only on alternating days. I wasn’t alone in my struggle. I didn’t even have it that bad. But I had discovered a line in my series of adventures that I couldn’t cross. I need water. Thankfully, Mr. Crônicas decided I was worth keeping, and showed up the next day with the truck from work and two 500L barrels in the back. It took three trips to the top of the farm and back. Over an hour to fill the tanks, 20 minutes to pump them into our cistern. What a man will do for love. And a hot shower. We decided to empty the cistern before filling it. The last dregs of our water supply had not been pretty, and better to rinse the cistern before putting in the new, fresh well water from the top of the farm. On a normal day, we’d just dump the water out and let it run willy-nilly wherever. But things were dying out there. So while Mr. Crônicas was on Water Trip #1, I formed a bucket brigade. I set buckets and watering cans under all the main faucets, and ran outside with one while the next filled. With the glaring, Brazilian noonday sun on my shoulders I watered fruit trees, and grass transplants, garden seedlings, and yard flowers. I sought every leaf of our hard work, and poured some life on it. It’s amazing the difference water makes. Plants literally get instantly greener. You can see them come alive again. You can see them sigh and stretch their leaves out. Bucket after bucket. The air around the farmhouse grew moist. The breeze became cool again. I was pouring out the last bucket as Mr. Crônicas pulled up. He linked up the pump, and water began to fall into the cistern. Water falling has never sounded so good. Water falling has never sounded so good. And this is what we have done every weekend since then. Life is almost normal again. We fill the cistern, and conserve during the week. My bucket brigade continues, watering the garden every morning and the yard every afternoon with our greywater from laundry and dishwashing. I am thankful for our luxury. We have a truck to bring water. An old pump to put it into the cistern. A water source that is not dry yet. We are rich. Thanks so much for your blogs. 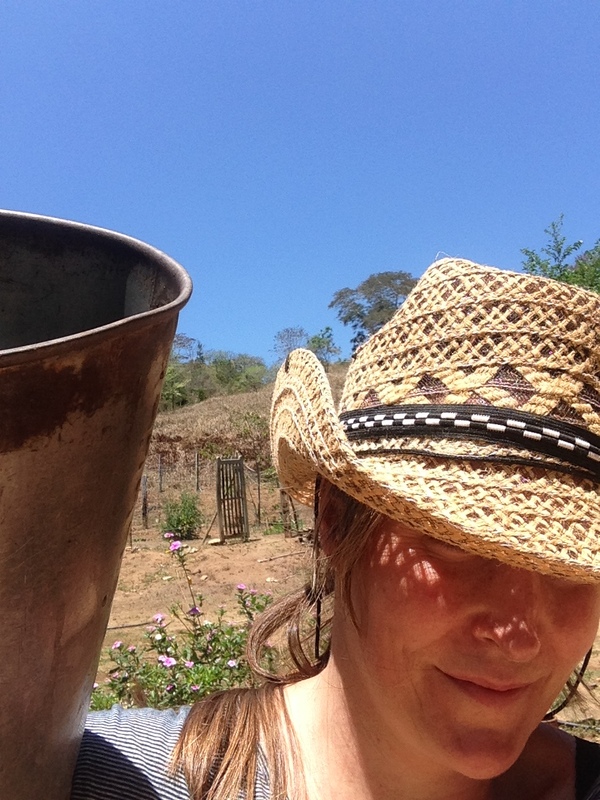 I am Canadian with a Brazilian wife who have a farm in rural Bahia, and I love hearing about your adventures. Keep writing! Hey–sorry for the delay on replying to you! What a marvelous compliment! Writing is harder now with a toddler, and yet the form of expression is SO much more necessary (before I revert to Brazilian baby babble!). Your compliment inspires me to jot down more of my thoughts and try to shape them into posts. Thank you! By the way–where in rural Bahia? North or south? We are near the Southern border–just 3 hrs from Vitoria da Conquista.